Sung by kids, Sung for kids! Someone once wrote: "From therising of the sun 'til the going down of the same, the LORD's name is to bepraised." Turns out it's OK to praise the Lord even AFTER the sun goesdown! 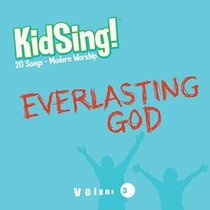 So these 60 tracks-selected from the most-sung songs in today'schurch-will have kids singing along 'til they can sing no more. With vocals byreal kids, the melodies and lyrics come across loud and clear, supported bygroove-filled rhythms and hot guitars. Modern songs include: "HowGreat Is Our God, God Of Wonders, Everlasting God, Here I Am To Worship, OpenThe Eyes Of My Heart, Blessed Be Your Name, Come Now Is The Time To Worship, Shout To The Lord, Lord I Lift Your Name On High, Forever, Breathe, Holy Is TheLord, Your Grace Is Enough." Classicsongs include: "Amazing Grace, How Great Thou Art, I Have Decided To FollowJesus, This Is My Father's World, On Christ The Solid Rock I Stand, Great IsThy Faithfulness, What A Friend We Have In Jesus." Someone once wrote: ?From therising of the sun ?til the going down of the same, the LORD's name is to bepraised.? Turns out it's OK to praise the Lord even AFTER the sun goesdown! So these 60 tracks?selected from the most-sung songs in today?schurch?will have kids singing along ?til they can sing no more. With vocals byreal kids, the melodies and lyrics come across loud and clear, supported bygroove-filled rhythms and hot guitars. Modern songs include: HowGreat Is Our God, God Of Wonders, Everlasting God, Here I Am To Worship, OpenThe Eyes Of My Heart, Blessed Be Your Name, Come Now Is The Time To Worship,Shout To The Lord, Lord I Lift Your Name On High, Forever, Breathe, Holy Is TheLord, Your Grace Is Enough. Classicsongs include: Amazing Grace, How Great Thou Art, I Have Decided To FollowJesus, This Is My Father's World, On Christ The Solid Rock I Stand, Great IsThy Faithfulness, What A Friend We Have In Jesus.